Just a few paces from Ealing Common station, this unassuming restaurant has a strong reputation for high-quality old-school sushi. The functional room is simply furnished with white-tiled floor, small wooden tables and a standard-issue sushi counter along one wall. It’s not much to look at, but it serves the purpose for a decent lunch or dinner. Sourcing the highest quality of fish is not a problem for Atariya as the company is also a fishmonger. 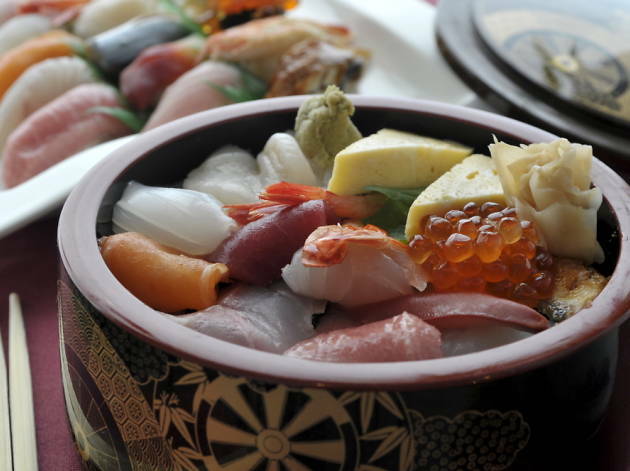 This also enables it to offer a wider range than most, with more than 20 nigiri toppings to choose from – including lesser spotted varieties such as turbot fin, razor clam and botan prawn – all of which are handled well. Prices have gone up a little recently, eliciting a few grumbles from regulars, but sashimi and nigiri sets still represent reasonable value at £15-£23. The ‘superior’ selection featured 14 well-shaped nigiri pieces, though the fish slicing was a little uneven. Highlights included fatty tuna as soft as silk, and turbot with just the right level of resistance as you bit into it. Less pleasing was the overpowering ume paste in a plum and shiso maki roll. This very basic and sparse restaurant serves very good sushi. This is one of the best places to get good quality sushi and other Japanese dishes...but it's the sushi you want to come here for. 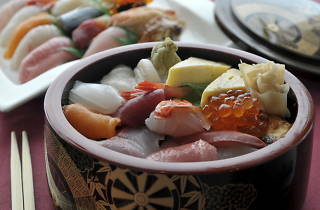 Atariya is a little chain and is very well known for the quality of their sushi. It's really yummy,a bit more expensive than you would like but definitely does not break the bank. We had a delicious meal of hot and cold dishes. The service is not great,I will admit. The waitress was a bit frostly. I would say come for the food and not the atmosphere. That being said we had a lovely meal and i would go back again. Amazing Amazing! Went for lunch with a friend when I visited London,Visiting London again with my fiancé and Nooo wayyyy Im missing going to atariya sushi!! What's the point of visiting London without stopping by atariya??? I mean seriously?? I had a terrible experience, but it had nothing to do with the food. When I go to restaurant is not only for the food but for the service, so imagine my surprise when after ordering starters, mains, beer and wine, the waitress comes to us while I'm in the middle of enjoying my desert with the bill and tells me we have to leave because the next customer is waiting. NO WARNING!!! First of all, if you had a reservation you should've let us know before hand, in which case we would decide if we wanted to stay or not; second, it wasn't like I was spending spare change, it was close to £60 and we were still planing to have sake, so interrupting our meal that way was just absolutely disrepectful, as if we weren't valuable customers; third, there were another 4 TABLES EMPTY when you literally kicked us out, that makes it even worse... needless to say I will never come back to this restaurant, you need to learn something about making customers feel welcomed... the worse part is that after complaining about what had just happened we barely got a weak apology from the manager, so what was supposed to be a celebratory meal turned into one of the worse hospitality experiences of my life... NEVER GOING BACK!! !